We've received two interesting letters from the school district last week. One was to let us know that Caitlyn scored well during testing last spring and would we like to consider doing more testing? The other was a notice about how the district isn't doing so well according to the standards established by No Child Left Behind. According to the letter, school districts need to meet a set standard (which was left undefined) in up to 111 categories to qualify as making "Adequate Yearly Progress". (Is it progress if you meet the standard two years in a row? Or is that Adequate Yearly Stasis?) The goal is to have "all students meet or exceed state standards in reading and math." The letter doesn't define the standards, nor does it provide a footnote to tell me where I could go review the standards. When I was in school, a million years ago and a couple states away, I heard a lot about The Curve, mostly from my peers. Sure, the teachers mentioned it in passing as a grading method, but it was my peers who asked about it all the time, confirming it's use, determining who had the score that "broke" The Curve, knowing their place on it. I never took a class in statistics. There's lots here I don't understand. I do know about averages, though. Take a group, total it, divide by the number of group members. If you plot out the individuals in the group, you'll usually get something that looks like the curve above. It represents something called a Normal Distribution. The idea is that, in a group, most characteristics (speed, size, intelligence, skill, coloring, etc) of the individuals in that group will fall into this pattern. Most of them will be average, at or around the peak of the curve, with some falling above or below average, tapering off to almost nothing at the extremes. There will always be a swallow who can fly faster than 24 mph, but most swallows will fly at or about that speed. 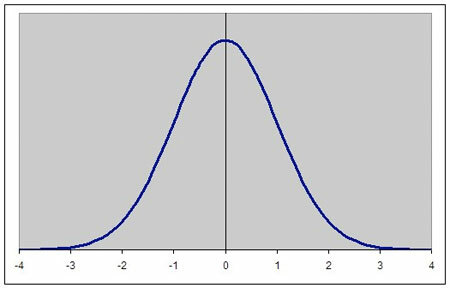 Unless something fundamental has changed in the last 20-odd years, Normal Distribution and the Bell Curve are still valid concepts. If so, then there is a very basic problem with the goal that "all students (will) meet or exceed state standards in reading or math." Either the goal itself is unachievable, since there will always be some students who are at the extreme back side of The Curve, or the standards are set so low as to be completely meaningless, since they would need to be something that every student, regardless of ability, could meet. Either No Child Left Behind is set up so that all schools and districts must eventually fail or the standards have been downgraded so that everyone can pass, translating to an educational system that doesn't even come close to adequately educating the majority of it's students. At least one of the problems here is the unfashionable-ness of admitting that individual people are truly unique. Oh, sure, there's the general celebration of No One Will Ever Be Just Like You. We are all Unique and Beautiful Snowflakes. But it's not appropriate now to have an educational system that outwardly acknowledges that some children may be more or less intelligent than average. Someone's self-esteem might be injured. Or that some children may have extra-curricular access to supplemental resources. That would mean acknowledging socioeconomic differences. The result is a system that will ultimately leave every child it serves equally uneducated. As a result of not achieving Adequate Yearly Progress, the district is now required to take a fixed portion of its federal funding and use it for "focused professional development for teachers and administrators." That's money that perhaps could be used more directly for the benefit of the students, now reallocated out of the idea that it's not the fault of the system or of our culture's inability to acknowledge and constructively deal with individual differences, but the fault of poorly trained teachers. If only the teachers could teach better, then they could simultaneously teach 30 children to pass a specific test, regardless of individual ability or situation. It's really no wonder that more and more curricula are about the tests, at the expense of science, art, music, social studies and recess. The garden suffered this summer from the weather and neglect. I didn't make it out as often as I might have to really maximize production. I should be grateful we didn't have a scorcher of a summer; I barely watered and things still limped along, more or less. On the other hand, I did assemble a checklist early in the year to guide me through the various harvests so I would know how much of what I was planning on putting by for winter. I may have only coaxed three whole carrots out of the garden this year, but I've got a full pantry and a full freezer. My checklist is broken down by storage method (dry, freeze, can, store) and includes a goal for how many jars of something to put away. This year I've been trying to note down conversions so that I'll know for next year that, for example, 5 pints of of cherry tomatoes dries down to 4 1/2 pint jars or that 30 lbs of shelling peas shells down to enough quarts to last until next spring. Our home blueberries put on a good show, despite starting late. 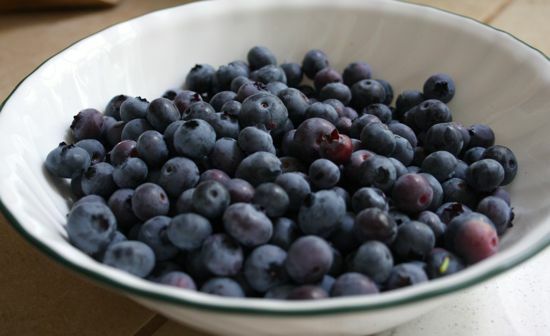 We had berries with breakfast several times, and I think there are at least two quart jars in the freezer that are full of homegrown blueberries. Caitlyn liked packing frozen blueberries in her lunches last year; I think between the homegrown berries and the u-pick berries we have enough for both lunches and the occasional muffin. 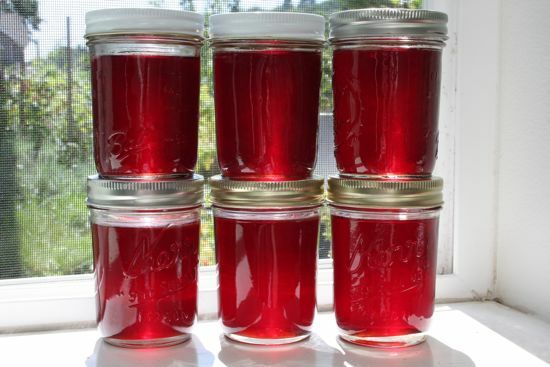 I also put by some frozen rhubarb and a couple cobblers' worth of homegrown cherries. Despite my fears of rust, the onions did well. 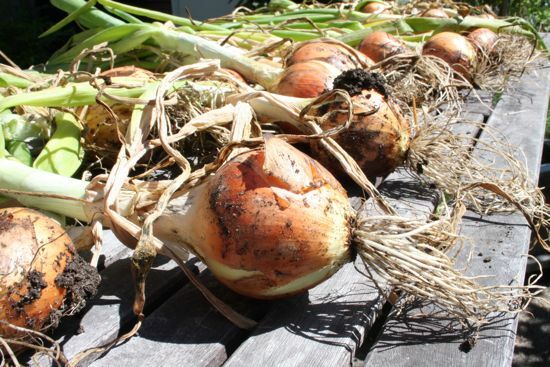 I'll still need a box before the farmers' market shuts down, but it'll last longer than last year's since it'll be augmented with the homegrown onions. Must try to remember to get the onions on a different day than the 20 pounds of apples. And the potatoes did really well. They are mostly small, but I've a good size box that's full up, and there are some plants still hard at work out in the p-patch. I haven't weighed the box, but I'd guess that the potato harvest this year is close to 50 pounds. For next year, I'm entertaining the idea of spreading the potatoes over more space (two back yard beds or more dedicated space in the p-patch); it's a super-easy crop, and I think I might be able to increase the size of the individual 'taters if I didn't pack the plants quite so cozily. 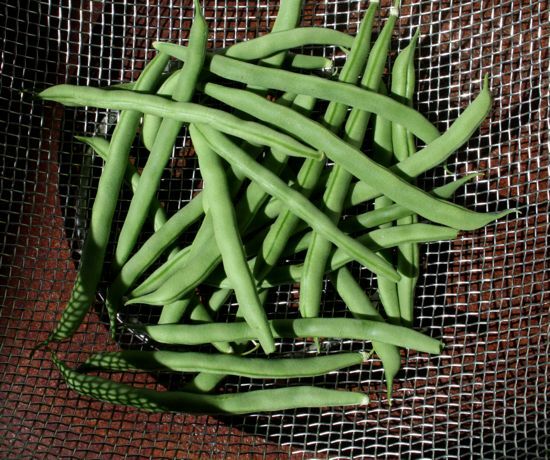 The green beans have produced, despite my neglecting them. I won't have extra to take to the food bank, but there are jars enough for us in the freezer. And the basil did better than previous years; we've had fresh basil to add to meals and I've got a dozen or so "basil cubes" in the freezer. 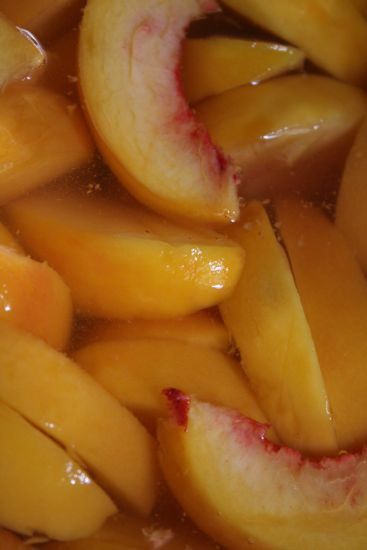 I canned a box of peaches and 4 boxes of tomatoes. I've blanched and frozen several jars worth of spinach (this time freezing the spinach directly in the jars, resulting in more tightly packed jars, which hopefully will keep us in spinach longer than last year), green beans, broccoli, zucchini, corn, peas, and roasted red peppers. I've dried a dozen pints of cherry tomatoes and an uncertain quantity of sweet peppers (4 bell peppers = 1 1/2 pint jar), both from the farmers' market. In another week or two, I'll move on to Asian pears before scrubbing the dryer out and putting it away for the year. All that's left, I think, are the whole things that will go directly to the pantry and fridge. I'll need to get lots of carrots from the market (to make up for the small backyard harvest and my complete failure to succession plant new batches of carrot seed). I'm thinking I'll get 3 or 4 butternut squash since this was not a good year for me in the squash department. I didn't even get any homegrown zucchini, which, if you know anything about the general abundant nature of zucchini, seems rather surprising. I think the garden may provide a couple of petite pumpkins before the weather starts to freeze, but I might pick up just one at the farmers' market. And, of course, the onions and apples. Hmm. All spelled out like this, perhaps we did better, both the garden and I, than I thought we had. Caitlyn has been pleading for pigtails as a hair style for at least a year, and I have finally caved. I've never been fond of the hair style and I may have been concerned it would take too long for Miss Fidget. But she holds still, more or less, and will even hold half her hair to the side so that the part is mostly straight down the back of her head. We've also discovered that this is the current best hair style for circus class, since there's no lump of ponytail on the back of her head to make her somersaults go sideways. The first day of school was Most Eagerly Anticipated again this year. 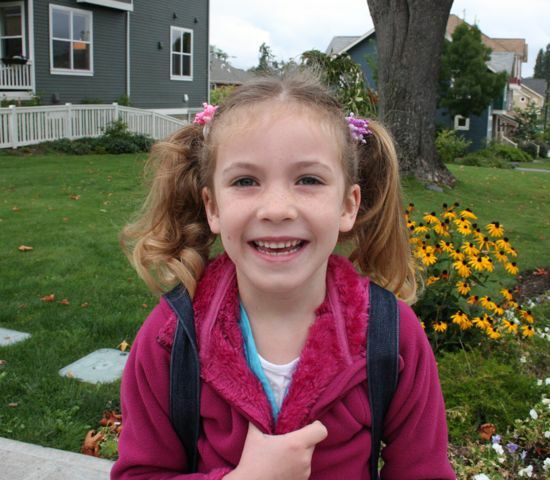 Caitlyn is a first grader, and this school thing is so old habit. Sure, they moved the start time back 30 minutes (as a cost cutting measure for the transportation department) and we're all, in our own ways, having a bit of trouble with the early mornings: I'm blearily staggering around and Caitlyn would rather look at her books than get dressed. We're building a strict routine for getting out the door on time and fully prepared for the day. And there is homework for first graders. Which seems totally bizarre to me, but then I don't remember homework until about third or fourth grade and by that time it was essays and science projects. It probably makes more sense to start earlier and with smaller assignments, for building good habits and keeping the whole concept of school somewhat appealing. Caitlyn is currently very excited about homework and will rush through the process of making her next-day's lunch so that she can go do her homework. I can't help but wonder how long it will last. And just like that, the summer is over. We went from clear skies and mid-80s to overcast and 68 degrees basically overnight. Not a moment too soon, in my opinion. It'll be tomato canning time shortly and that's never fun when it's still toasty outside. But more than that, I'm ready for autumn. Our summer was very full, not always in the ways I'd planned, and not particularly relaxing. I'm still trying to overcome my disappointment that I wasn't able to give Caitlyn the kind of summer vacation I wanted to, with outings and hikes and projects of either artistic or culinary natures. I suppose I'd created some fantasy notion of easy summer days of magical Mama-Caitlyn time as we barreled through the spring and galloped into summer. Things seemed crazy busy for me even then, and I didn't expect that it would just continue that way. Which, in hindsight, is silly, since I don't really recall doing anything to make it less crazy busy except complain. Don't think that there weren't good things in our summer. We went berry picking (strawberries from Schuh Farm, blueberries from Bryant Farm, blackberries from over by the P-Pach). There was a group camping outing and Extra Large Marshmallows. Caitlyn got a week of day camp and started ballet again. We sat outside and watched How to Train Your Dragon in the park. There were picnics at the farmers' market and time with grandparents and aunts and cousins. We even managed a couple of family bike rides. I'm hoping for a slower pace this coming season. I'd like more creative time for me (my sewing machine must think I don't like it anymore) and more slow time for all of us. I'd like more leisurely cups of tea, more soup. I'm ready for Wednesday to move back inside and for our movie nights to resume. I'd like some guilt-free reading, by myself and with Caitlyn (must make sure she doesn't lose sight of the fact that she can still read for fun, not just for school). Oh, and while I'm at it, let's have some walks to enjoy the leaves as they fall, some crisp apples, and some rain to refresh the garden and my soul. 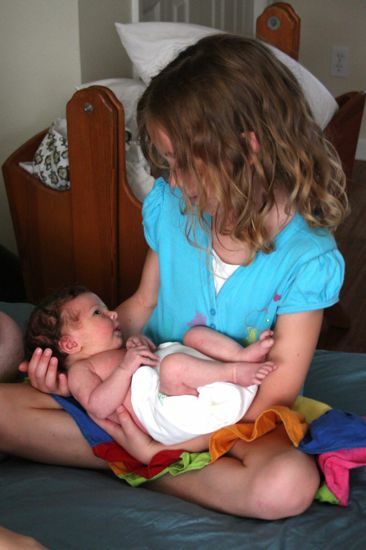 Caitlyn has been eagerly anticipating the arrival of her newest cousin, pretty much ever since she was given the ok to talk about it. And yesterday she was able to hold the baby. She's talking already about babysittting, which freaks me out a bit. I guess it's true that Caitlyn will be 12 when this little one is 6, and they probably could be allowed to walk to the park together or something, but it's entirely possible that I won't be ready for that when the time comes.